LIVERMORE, Calif., March 30, 2015 – Topcon Positioning Group announces its latest edition 3D mobile mapping system — the IP-S3 — will be unveiled at the SPAR International 3D Measurement and Imaging Conference. 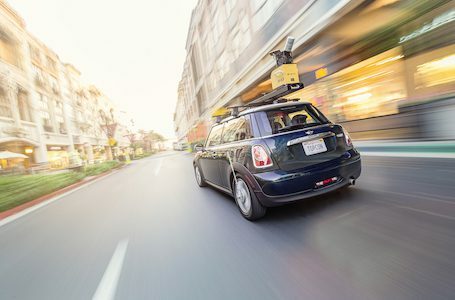 The system employs the integration of an Inertial Measurement Unit (IMU) and GNSS receiver with a vehicle’s onboard electronics to offer high-density mobile digital imaging. Scanning at 700,000 points-per-second, the rotating LiDAR sensor captures the 360-degree environment with 32 internal lasers. The IP-S3’s six-lens digital camera is designed to provide data-rich results with its 30 MP panoramic imagery. The system pairs with Topcon Mobile Master Field and Office software suite to perform all post-processing functions in a single application. “The software suite offers a complete all-in-one processing workflow, turning raw sensor data collected by the IP-S3 system into rich and precise point clouds and images,” said Rihner. The IP-S3 will be on display at the SPAR conference from March 30 – April 2 in Houston, Texas. Topcon Positioning Group is headquartered in Livermore, California, USA (topconpositioning.com). Its European head office is in Capelle a/d IJssel, The Netherlands (topcon-positioning.eu). Topcon Positioning Group designs, manufactures and distributes precise positioning products and solutions for the global surveying, construction, agriculture, civil engineering, BIM, mapping and GIS, asset management and mobile control markets. Its brands include Topcon, Sokkia, Tierra, Wachendorff Elektronik, and 2LS. Topcon Corporation (topcon.com), founded in 1932, is traded on the Tokyo Stock Exchange (7732).